December 19th, 2004. I will never forget that day. I spent most of it outside, huddled under an awning extending forth from Hec Edmundson Pavilion. I was a student then, content to loiter for hours on end for a good seat at Husky basketball games. The Huskies played North Carolina State that day. It was a Sunday. A 5:00 p.m. tip-off on the West Coast. Just one year prior, the Dawgs had been on no one’s radar. They had been in the midst of a four-year stretch of futility that spanned two coaching regimes. But then they kicked off the 2004 calendar year by winning ballgames. And lo and behold, they returned to relevance by making the ’04 NCAA Tournament. Now here we were, nine months later, and Washington was in the early stages of their 2004-2005 season, ranked 18th in the nation, playing a meaningful game against a nationally-ranked opponent. Remember the NBA? My trip to a Blazers game. We don’t have an NBA team anymore, so I had to go to Portland to watch basketball played at its highest level (thanks, local government). That’s where I was Monday night, amidst a crowd of rabid red-and-black emblazoned fans, cheering on the Trailblazers as they battled the visiting Philadelphia 76ers. This is my chronicle of the night’s events. Enjoy. In case there is any debate about who number one on this list should be, let me propose this question to you: Out of the eleven people on our countdown, how many would you say have a legitimate shot at putting together a Hall of Fame-caliber career? The answer is simple: One. One guy, and it’s this one right here, Brandon Dawayne (bet you didn’t know that was his middle name) Roy. Throughout his adolescence, Brandon Roy quietly emerged as one of Seattle’s greatest ballers of all-time. At Garfield high school, he played on a team that featured a number of local greats, none of whom he really overshadowed. There was his brother, Ed, for one. Future USC product Roydell Smiley was another. There was the quarterback, Isaiah Stanback, who spent his winters on the court for the Bulldogs. Future Huskies Anthony Washington and Will Conroy also played on those teams, and Roy, at the time, was just another piece of the puzzle. That trend continued when he finally ended up playing for the Huskies. That moment didn’t come until halfway through the 2002-2003 season, after a long drawn-out process that delayed Roy’s entry to the University of Washington. After needing four attempts to nail down the SAT’s, Roy had been on a roller coaster ride of a journey trying to figure out what to do with his life. After graduating from Garfield, Brandon initially declared himself eligible for the 2002 NBA Draft, before withdrawing after some consideration. Then, with college off the horizon, he began working at a local shipyard before finally taking another crack at higher education. When he ultimately ended up with Lorenzo Romar’s Husky basketball team, no one expected too much, too soon from a player who had spent a full year away from organized hoops. As a freshman, Brandon made a limited contribution to a young Husky ballclub that was going nowhere fast. As a sophomore, Roy played an integral role in leading the Dawgs to the NCAA Tournament for the first time in five years. He averaged just under 13 points per game and was viewed as an emerging leader on an improving team. To start his junior year, Brandon suffered a knee injury during the Great Alaskan Shootout in November. Diagnosed with a meniscus tear, Roy returned in late December, earlier than expected, to lead the Huskies past a ranked North Carolina State team that had beaten UW a year prior. For the remainder of the season, Roy came off the bench as the team’s sixth man, deferring to starter Tre Simmons, and providing much needed energy in the second unit. The strong showing by Roy that year garnered noticeable interest from the NBA; Brandon wasn’t having any though, and announced he would be returning to Montlake for his senior season. As a senior, B-Roy emerged as The Man. He went nose-to-nose with Gonzaga’s Adam Morrison in a Husky victory early in the year, set a career high in scoring, and by the end of the season had locked up the Pac-10 Player of the Year award over runner-up Leon Powe. Roy became a legend at UW and helped take a Husky program that was down when he arrived, to the top of the conference by the time he left. The national audience recognized his achievements as well, naming him First Team All-America, only the second Husky ever to garner such an accolade. Next stop for Brandon, the NBA. In the 2006 NBA Draft, the Minnesota Timberwolves of all teams selected B-Roy sixth overall. In quite possibly one of the worst deals ever, they shipped Brandon off to Portland for the answer to a trivia question, Randy Foye. As a rookie, Brandon simply took over the league, earning Rookie of the Year honors and becoming the face of the Blazers in the process. In his second year, he fared even better, being named to the All-Star team and even earning some early season MVP talk. Now in his third season, Brandon has solidified himself as one of the league’s elite players. He’s currently averaging 22.6 PPG, 4.8 rebounds, and 5.2 assists. He still does everything well, but can now score in bunches in addition. In a few short weeks, he’ll become a two-time All Star after only three years. His #3 jersey will be retired by the UW this week. He’s about to become a father of two. 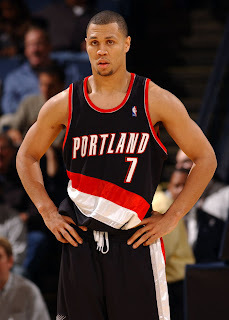 On and off the court, Brandon Roy has put together one hell of a career. When we talk about the greatest Seattle-area basketball players, his name will always emerge and he will always have to be considered near the top of the list. With any luck, one day we’ll be referring to the former Bulldog, former Husky, and current Blazer as Brandon Roy, Hall of Famer.